Bon Dieu! In this Cajun take on a Brothers Grimm classic, one wonders if you can ever have too much of a good thing? When fisherman Paul catches a talking fish, it promises to grant him a wish if he lets it go. As proof, the enchanted sac-à-lait piles crawfish into his boat and Paul returns home with his reward. Paul’s wife dreams up progressively outlandish demands each time he returns home. Eventually everyone learns that you must be careful what you wish for if you want to hang on to what’s really important. 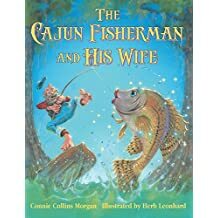 In this third collaboration between author Connie Collins Morgan and illustrator Herb Leonhard, the wonderfully woven tale is brought to life with moody and expressive images with a Louisiana flair. Readers of all ages will delight in this soon-to-be classic Cajun tale!